Hubbard Street Dance Chicago has returned to Randolph Street to showcase its Summer Series, a three-piece program that – if not as warm as the season it ushers in – generously records the latest passions in the world of dance as accurately as a seismograph. The start of a bold, new collaboration, the most significant event was the company premiere of the evening’s second offering–the hauntingly named Following the Subtle Current Upstream. The 2000 creation of Alonzo King (originally commissioned by the Alvin Ailey Dance Theater), artistic director of the ground-breaking, San Francisco-based LINES Ballet, this free-wheeling experiment in motion has the ensemble, clad in monochromatic leotards, languorously or frenetically erupting to a score by Indian tabla composer Zakir Hussbain, South African balladeer Miriam Makeba and composer Miguel Frasconi. Presumably depicting “the subtle currents that exist in the body as the path of liberation,” this fluid, sometimes seemingly improvised, choreography reflects King’s interest in grounding movement in the moment, with shifting combinations of dancers flowing in and ebbing out of formation, much like the thunder that interrupts the shape shifting. 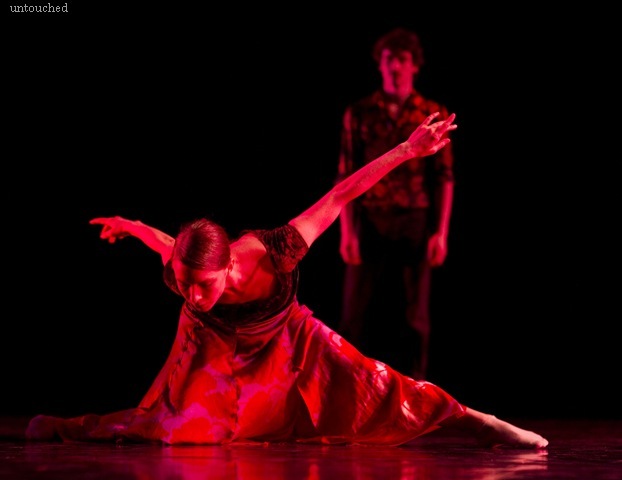 The Hubbard Dancers seem entirely at home in this inventive and self-fulfilling enterprise. The remaining works are back by popular demand, opening with Aszure Barton’s Untouched, a maroon-hued creation performed against an elegant, half-opened curtain. 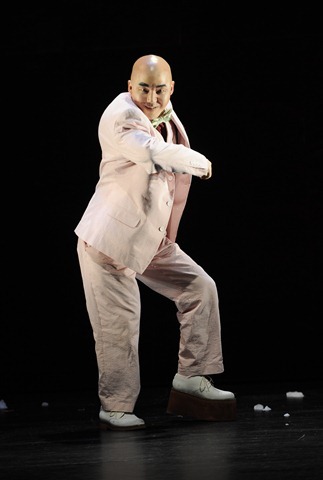 Sensuous with sudden, gyrating hip swings and outstretched hands and performed to music by Njo Kong Kie, Curtis Macdonald and Ljova, Untouched was set in motion before the music was selected–so, unusual for dance, the latter is servant to the former. The result is a series of mysterious processions, comings and goings, separated by curious offstage wolf whistles, that managed to be sensuous and haunting. Hypnotic stuff, Untouched hardly describes its effect on the audience. Finally, Jiri Kylian’s 27’52”, named for its near half-hour length, opens as a company warm-up, with a huge bank of lights dangling over the dancers. The dancers are then seen to perform on a tear-away white floor that will later give way to a tear-away black one. Like scenes from a David Lynch film, the diverse action unspools with a spoken text in English, German and French extolling the artist’s vocation. The score by Dirk Haubrich was backdrop to quirky movements, descending and ascending curtains, and jerky aerobic exercises that seemed to create a waking dream. Perhaps a bit too abstract to engage us beyond its eclectic activities, nonetheless this dance game of alternating intimate encounters followed by solo exits seems as much a metaphor for life itself as dance deserves. She loves him. He loves her. A woman and man express the spectrum of emotions for loving the wrong person. 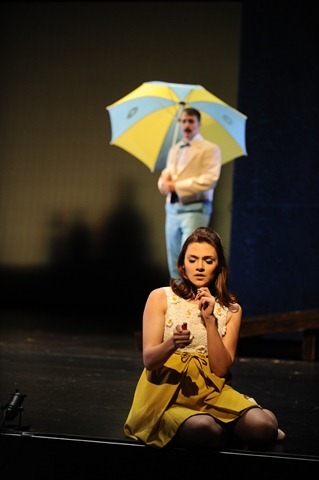 Chicago Opera Theater concludes its 2011 Spring Season with HE/SHE, a operatic tribute to obsessive love. Deviating from a traditional show, Chicago Opera Theater presents a concert experience. 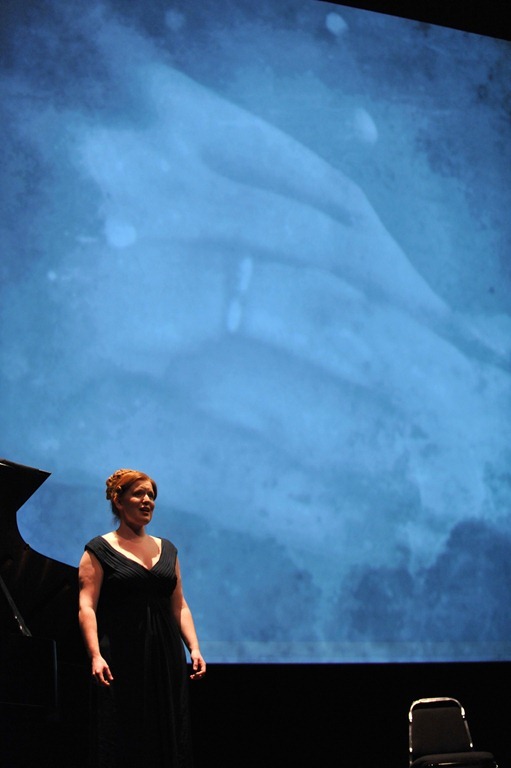 In the first half, a mezzo-soprano sings in German Frauenliebe und Leben by Robert Schumann. Following the intermission, a tenor sings in Czech The Diary of One Who Disappeared by Leos Janáček. The combination proves an intriguing and entertaining gender sing-off. It’s not just another he-sang/she-sang side of the same story. The pieces are totally separate but connected through the misery of mutual unrequited love. HE/SHE passionately sings his/her heart out for the love of her/him. After the stunning spectacles of Death and the Powers (our review ★★★) and Medea (review ★★★★); the simplicity of the HE/SHE set-up startles initially: a piano; he or she. There is no elaborate scenery, costumes or chorus. The orchestra pit is empty. It has a no-thrills send-off feel. When the music starts, the stark stage fills up with robust emotion. Jennifer Johnson Cano sings exquisitely the story of her man. Cano shares the relational joys and pain with a controlled ‘this must be a dream’ desperation. Cano poignantly sings about ‘staring into an empty world.‘ Her sadness permeates the audience with lingering despair. It’s a powerful contrast to Joseph Kaiser. Kaiser commandingly sings with a fury of intensity. An animated Kaiser thunders about the bewitching powers of a gypsy. His emotional rant engages through to a climatic finale. Brandy Lynn Hawkins (gypsy) and the off-stage voices of Lelia Bowie, Hannah Dixon and Megan Rose Williams aid the storytelling with sweet, haunting melodies. For both segments, the back of the stage turns into a full-length movie screen. Traditionally, supertitles are projected in snippets above the stage. For HE/SHE, the supertitles become illustrations of the emotion. For Frauenliebe und Leben, the supertitles are romantic, handwritten script. They gradually appear and disappear in a montage of old fashion photographs. 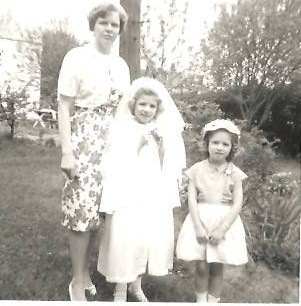 The black and white photos beautifully chronicle a woman’s life from childhood to marriage to death. The Diary of One Who Disappeared uses a chaotic, bold font. The words are spliced onto lush, vibrant images of nature. Within the abstract artistry, a ghostly woman sporadically appears. Projection designer Hillary Leben effectively gives the audience snapshots of what’s going on inside the heads of the tormented lovers. The entire show is accompanied by a solo pianist Craig Terry. 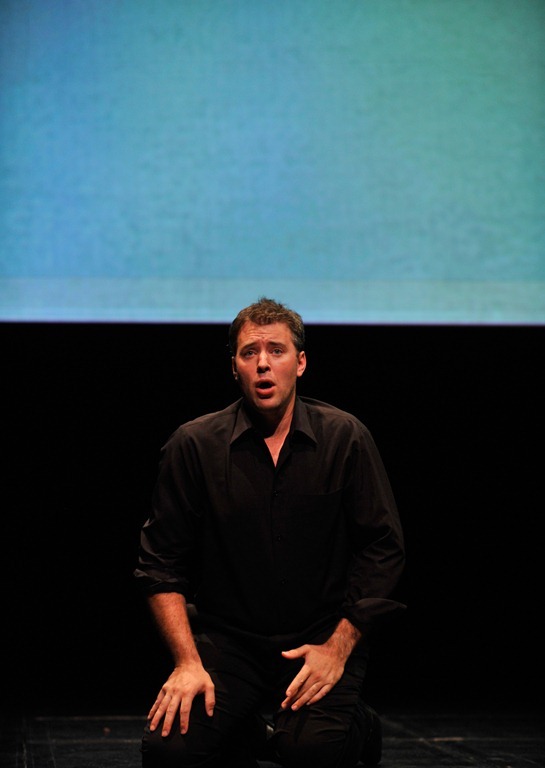 The uncomplicated choice continues to draw focus to the complex emotional singing. In theory, the decision is simple and strong. In reality, the Harris Theater’s concrete facade is an echo chamber. Without an orchestra to provide a sound buffer, every cough, whisper, dropped program is an audible distraction. Despite that unwanted soundtrack, HE/SHE boldly finishes off Chicago Opera Theater’s innovative season with a return to the basics: spectacular operatic singing! You could call it an elaborate futuristic puppet show or a techo triumph that pushes opera deep into the 21st century. 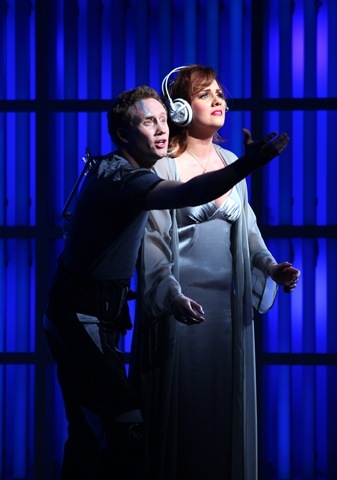 But you won’t confuse Death and the Powers: The Robots’ Opera with any staging you’ve seen. 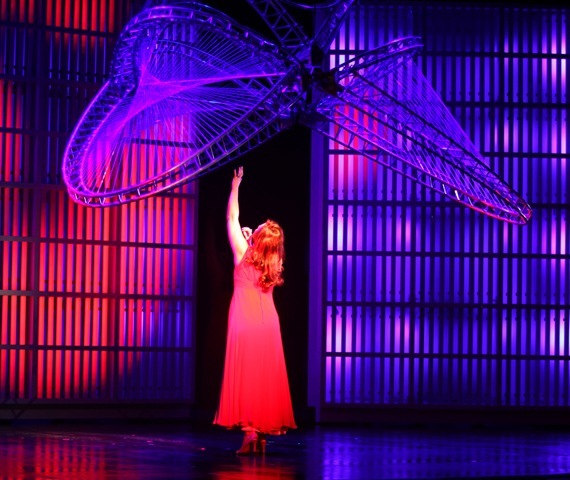 Developed by composer Tod Machover’s Opera of the Future Group at the MIT Media Lab, this 90-minute cyborg concoction, a Midwest premiere, is based on a libretto by former poet laureate Robert Pinsky and staged by Diane Paulus, who recently revived Hair on Broadway. Together they’ve created a curious amalgam, a sci-fi one-act opera that could also pass for a domestic tragedy. The plot quirkily combines our fear of death with our ardor for and reliance on technology. Though apparently unwilling to risk consigning his dying body to frozen cryonics, multi-billionaire inventor Simon Power still refuses to die in the flesh when he can live in the circuitry. 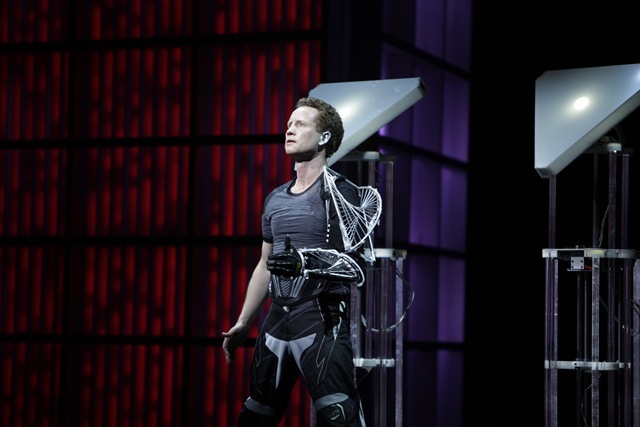 As dying focuses his faculties, he devises a scheme to “download” himself into the world he refuses to leave behind, to escape from matter into the machine. It’s called The System: This Matrix-like hive of embedded memories and personality will perpetuate Powers indefinitely. You CAN take it with you, it seems. Of course, those left behind can’t help but feel a bit abandoned, especially his doting daughter Miranda (an allusion to the magician Prospero’s daughter in The Tempest). She clings to the world of “sweat and death,” but her mother Evvy, now a semi-widow, is gradually captivated by the System: Evvy cherishes how well this sprawling motherboard has cloned Simon–even though she still craves to be touched. Behind all the Frankenstein-like wizardry is a bionic boy named Nicholas whose arm was transformed by Simon’s benevolence and who wants to repay the favor with electronic immortality. But the System’s scheme requires the reconstituted Power to turn his back on the finite world of flesh. His “departure” causes a worldwide financial depression. When confronted by the Miseries, a wailing crowd of distressed supernumeraries, not so simple “Simon” retreats back into his cyber cocoon. Miranda is left to choose between real life and an authentic simulation. It’s easy to find the brain behind this bold enterprise, a bit harder to locate the heart. (More on that later.) With its “disembodied performance” of feedback sensors, customized audio system of 143 speakers, analysis software, surround sound, movable and brightly lit robotic androids, collapsible, bird-like Chandelier, and massive rotating control banks (the bookshelf-like “Walls”) that reflect Simon’s every mood change, the production is itself a “system” that dominates the doings. Far more impressive than affecting, Death and the Powers keeps us as detached emotionally as Simon is physically removed from reality. Happily, James Maddalena’s all-controlling Simon refuses to be cowed by the elaborate equipment that surrounds and finally absorbs the mad mogul. He sings up a storm, a swan song that haunts the action. Simon’s “second coming” obsession with a cyber rather than cellular afterlife is echoed by Hal Cazalet’s equally possessed Nicholas. It’s even shared by Emily Albrink’s easily converted Evvy. (This wife loves Simon enough even to feel him in banks of modules and flashing book spines.) It’s up to an anguished and effective Sara Heaton to keep tortured Miranda in the real world. Valiantly and defiantly, she refuses to sacrifice the “meat” of mortality for the sinful pride of becoming your own posterity. With musical amplification by the Boston Modern Orchestra Project conducted by Gil Rose, Mahover’s pulsating score eschews melodic rhapsodies for the coiled intensity of frenetic passages and occasionally rhapsodic outbursts. 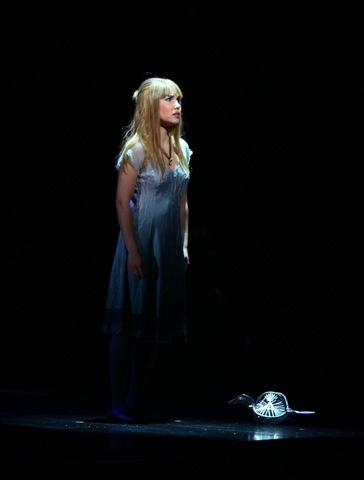 Pinsky’s brilliant libretto lifts it throughout. This proud poet delivers fascinating riffs on the paradox of running out of matter but not out of time and the hubristic arrogance of Power’s neo-Faustian bargain with the all-sustaining System. It’s an awesome tour de force, enough to cement C.O.T.’s reputation for enterprising risk-taking, not the usual menu you encounter from an opera company. This state-of-the-art showcase for electronic innovation is probably not the future of opera (it still comes down to singing a story). But it’s a bracing look at a brave new world. Death and the Powers will either soon be dated or depict the shape of things to come. But until the computer writes the review, I pick meat over machinery. Criticism comes easy. Composition does not. 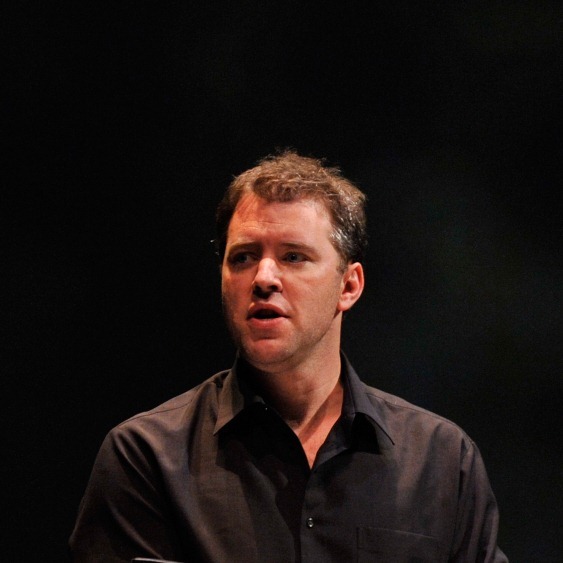 In fact, this opera’s composer, Jake Heggie, colorfully writes in his program notes that sometimes he has to “[smash his] head…on a keyboard to get any notes out at all”. So, with due respect to the difficulty and nobility of the enterprise, and to those who passionately answer the call anyway, I’m going to offer what is probably a minority opinion among critics and opera-lovers alike in questioning the outcome in the case of Heggie’s opera Three Decembers. 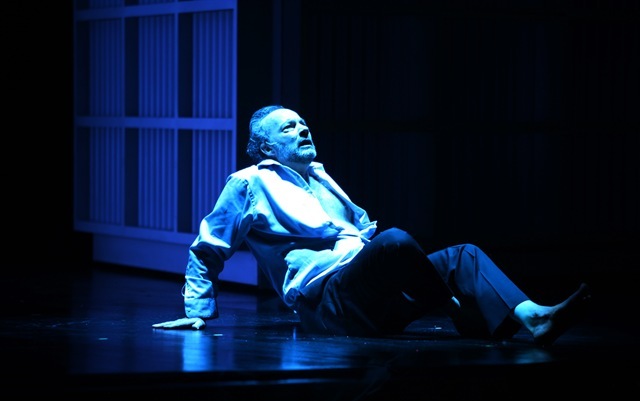 Librettist Gene Scheer based the story on a short play by Terrence McNally. An adult brother and sister (Charlie and Bea) are struggling with their relationship with their mother (Madeline), a famous actress who neglected them to advance her career. Eventually, the mother reveals a surprising family secret that clarifies her behavior and makes forgiveness possible. Unfortunately, as a portrayal of family dysfunction, the story is simplistic and trite. Despite its aspiration to depict a fascinating but fractured family in the manner of Tennessee Williams, the libretto is largely an exercise in resentful adolescent whining. Nevertheless, this production did have some strengths. First, the legendary mezzo-soprano Fredericka von Stade sang the role of the celebrated actress and indifferent mother. Her blithe, graceful singing testified to her status as one of the world’s great lyric sopranos. Stade’s Madeline was both selfish and charming, a result of skillful acting that wove flamboyance and naivete into a single fabric. There was no dissimulation in her character – just obliviousness. Hers was a classic diva whose narcissism was almost benign, being tempered by a dormant conscience. Matthew Worth sang the role of Madeline’s gay son, Charlie. His character’s indignation and stubbornness were explicit, and I heard the ring of sincerity in the fear that Charlie felt during his partner’s illness and the sadness after his death. Because Worth didn’t hyperbolize the affectivity in his role – and despite the driving petulance written into his lines – he delivered some touching moments. In the role of Bea, Sara Jakubiak did what she could with bad material. Her good singing notwithstanding, she couldn’t overcome the banality of her character. Reaction depends on expectation. Not having heard Three Decembers before, but being aware of Heggie’s postmodernist tendencies, I didn’t go to the performance expecting Puccini. Rather, I was looking forward to interesting musical surprises, perhaps dissonance, fragmentation, or structural disunity, while hoping for enough neoromanticism to give some meaning to those surprises. The tonality of the score would probably please Puccini after all, but the totality might appeal more to Janáček . Within the strong dissonances of Heggie’s music there are passages of long, lithe melodies with pleasant lyricism, especially in the duets and trios. Sophisticated harmony is present, along with tantalizing unpredictability. Even so, however, most of the vocal lines give the impression of confused and aimless arioso. Whether musicologists ultimately classify it as such, or as Sprechstimme or recitative, the music feels arbitrary and unstable, as though trying hard not to be hummable just so it can claim originality. Furthermore, the frequent screeching of dissonant woodwinds made me wince. What wasn’t boring was downright irritating. Three Decembers could be a compelling opera if the story were fresher and the music shaped by what Heggie’s modernist/premodernist predecessors (Stravinsky, Prokofiev, Bernstein, and others) understood about antagonism and synergism as they apply to convention and innovation. As it is, Heggie’s score assaults or frustrates the senses more often than it uses them to frame an emotion or an idea. Disappointment wasn’t among my expectations as the curtain rose, but, I regret to say, it was my reaction as the curtain fell. Even though human culture has changed since Apollonius wrote about Jason and the Argonauts, human nature has remained basically the same. Cavalli’s 17th-century opera Jason punctuates this simple truth. Whether we approach Jason as an ancient myth, a Baroque soap opera, or a hybrid of the two, Chicago Opera Theater’s current production keeps it meaningful to a 21st-century audience by distilling the drama and comedy from the story, along with the gravity and silliness of human life, the wisdom and folly, and the nobility and profligacy. And all this in a tidy 165-minute package that delights the ears and the eyes. The single greatest strength of this production lies in the characterizations. Every singer defines his or her character sharply, and as a result the wonderful wit in this opera sparkles. Even while flirting with exaggeration, the cast had the good judgment to stop before becoming cardboard caricatures. 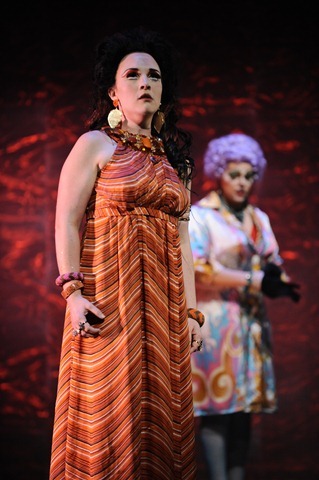 Because the singers understand that Cavalli’s music usually parallels Cicognini’s text in the rhythms of speech, their singing was cogent and perceptive. This is especially merciful because recitativo can be a crushing bore in unimaginative or undiscerning musical hands. COT, however, vivified the score by infusing it alternately with verve, flair, delicacy, and warmth. The connection between Jason and the story of Jason and the Argonauts is more or less nominal. Gone are the adventures. Jason is a married father of twins, and he’s cheating on his wife with Medea, who has also borne him a set of twins. And up until the happy ending, we’re treated to humor, scheming, deception, bawdiness, misapprehension, and attempted murder. But no little ones are killed. 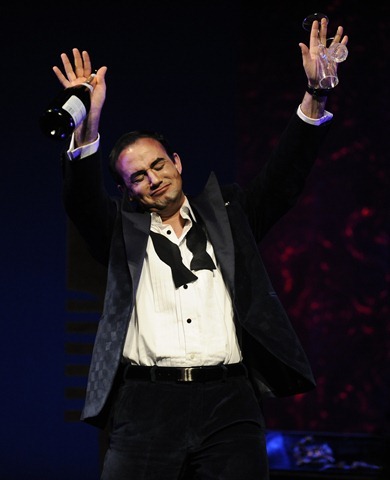 In the title role, Franco Fagioli gave us a believably selfish and hedonistic Jason, who seeks sexual conquest more than he does military glory. But his dormant conscience, which redeems him in the end, was always at the edge of detectability. Fagioli’s countertenor was as smooth as a river pebble, and it had an athletic quality with a refreshing clarity throughout his range. Fagioli set the tone for the entire drama with Jason’s first aria, in which he captured the “hero’s” sizeable character weakness and underscored the fact that Jason hadn’t gotten where he is by means of a John-Wayne-style grit. Because of Fagioli’s success in this regard, transposing Jason into a 1960s James Bond was all the more clever in its sarcasm. Consequently, Jason’s redemption at the end was especially convincing as he came to recognize his appalling behavior. 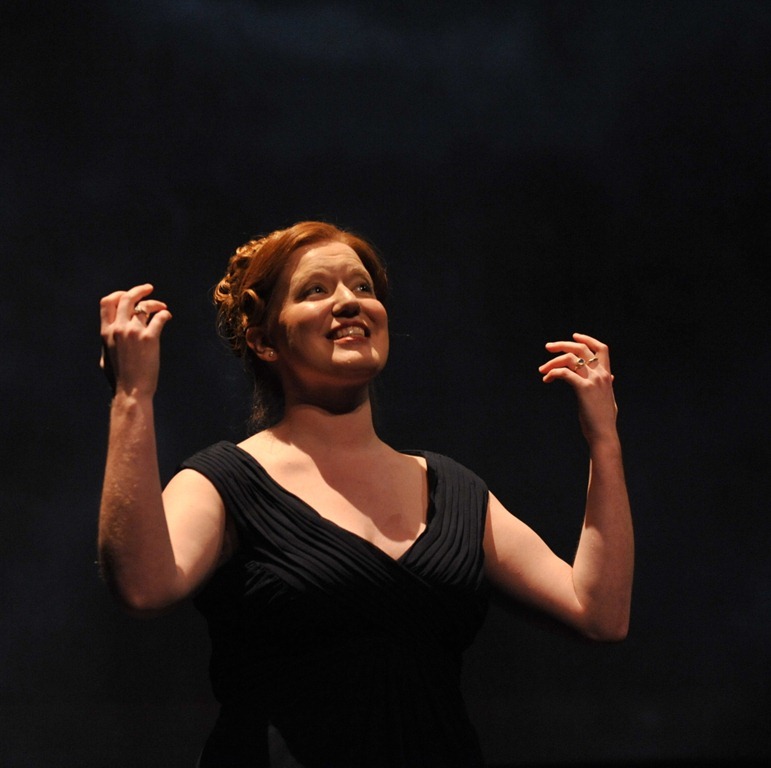 Singing the role of Medea was Sasha Cooke. Her skillful mezzo soprano and the panache in her acting gave us one of the finest moments in the performance: her invocation of the powers of darkness to help Jason in his quest for the Fleece. The feeling she created wasn’t one of temporary madness, though her hinges did loosen. Rather, she capitalized on the changing meters and the repeating notes to create a driving energy that was rational and singularly focused on Medea’s purpose. Julius Ahn brought forth the politically incorrect comedy relief as the servant Demo, the clubfooted, hunchbacked, stuttering dwarf. 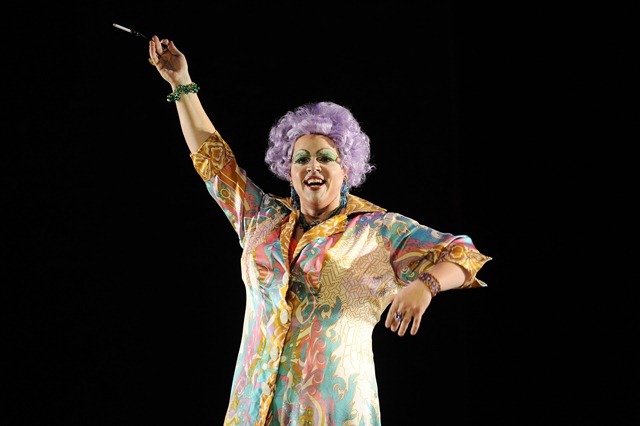 The unique coloratura of this role differs from that of traditional bel canto in that Cavalli’s music actually uses the peculiarities of stuttering for its structure and speed. Demo’s problem swells in his melismas but recedes in his arias. Aware of this device, Ahn sang the false starts and minced repetitions with apparent ease, while having his character display the expected, and sympathetic, frustration. In the role of the disgraced Isifile, Jason’s wife, Grazia Doronzio sang movingly. But the abandoned wife and mother showed more than just a soupçon of self-pity, and there were a few times when I found myself wishing that she’d stop wallowing in it. After all, she is a rich and powerful queen. 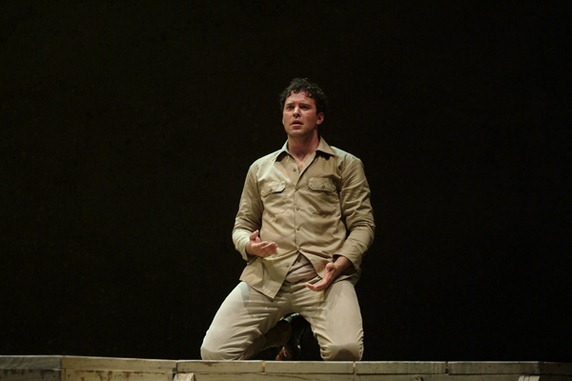 Tyler Nelson’s portrayal of Delfa, Medea’s servant, was quite funny, albeit just one cigarette away from being a cliché. Vale Rideout made Egeo’s unhealthful obsession with Medea suitably disturbing until the end, when we forgave him for being a victim of love. Although his tone was deep and rich, his vibrato was so wide in the melismas that the pitch sometimes disappeared. The flaws in this production, though noticeable, didn’t detract from the experience. But they do recommend some additional polishing. A few times the singers and their lights had to find each other on stage, and the stagehands were visible while moving set pieces during the action. Moreover, the movable scene dividers were a bit tacky, inasmuch as they looked like large boxes onto which gift-wrapping paper had been pasted, with creases and seams clearly visible. Despite the passing of three and a half centuries, Jason hasn’t lost its relevance. The regret is there, alongside the grief and the spitefulness, all three of which burned right through this sizzling production. And what about the low humor? Maybe it’s cynical to say so, but even the cognoscenti feel less guilty about laughing at it when higher expectations are standing by. Like their predecessors, modern audiences do enjoy a witty mix of vulgarity and refinement, especially, as in this opera, when vice can bump up against virtue with a wink and a grin. ABOVE: Director Justin Way and conductor Christian Curnyn talk about Chicago Opera Theater’s new production of Cavalli’s Jason (Giasone). Yes, you’ll see Moses part the Red Sea – and you’ll also hear some of Rossini’s most beautiful music! Join us for an evening that begins at State and Lake in TheWit Hotel. Grab a burger, and two beers, before the final dress rehearsal of the opening opera in COT’s 2010 Spring Festival Season. Joanie Schultz, the assistant director, will be on hand to talk about the opera. And Moses himself will be there too, get your picture taken with him and you’ll walk away with a souvenir! Event begins at 6 p.m. at State and Lake (in theWit Hotel). Show begins at 7:30 p.m.
For reservations call 312.704.8414 and mention"Theater Thursdays" or click here. Malinowski’s parents are Deaf, with a capital D. In Deaf culture, a “Deaf” person is someone with a hearing loss who is part of the Deaf community and uses American Sign Language. A “deaf” person is someone who has a significant hearing loss, but who is not culturally Deaf. Although she is hearing, Malinowski grew up in the Deaf community, straddling (and often bridging) the worlds of mainstream American culture and Deaf culture. 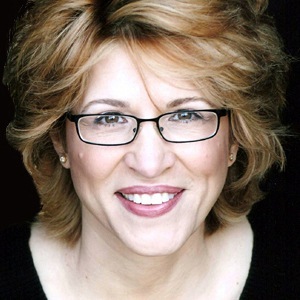 Malinowski has acting credits in theater, television, and film. 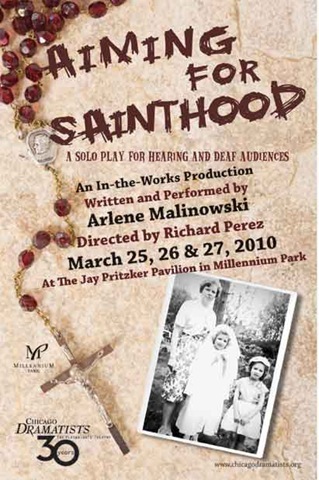 In addition to the trilogy of which Aiming for Sainthood is a part, Malinowski has written and starred in three solo one-act plays which she has performed in multiple venues. For now, Chronic, the third show in Malinowski’s trilogy, is in the conceptual stages. She continues to educate, and not only through her solo shows. Malinowski has taught at colleges throughout the country and currently teaches solo intensives in her studio in addition to teaching at Chicago Dramatists, where she is Resident Playwright. Theatergoers will have the opportunity to see Aiming for Sainthood this weekend at Millennium Park as part of the In the Works series. Aiming for Sainthood will be produced later this season at Victory Gardens Theater’s new Studio Theater in Chicago. The hearing daughter of devout Deaf parents must navigate through the cross-cultural maze of the medical world, the Deaf world, and the world beyond. This story is about parents and children, Deaf and hearing, love and forgiveness, faith and tolerance, and finding yourself amid the clash of cultures we call America. Thursday, March 25, Friday, March 26 and Saturday, March 27. All shows at 7:30pm. NOTE: With the In the Works series, audiences have a chance to sit on the stage of the Jay Pritzker Pavilion, experiencing works in development by local theater artists or companies. The series is supported by a grant from Boeing Charitable Trust.